Happy Valentine’s Day! Here are some of our favorite Valentine’s Day recipes we have made in the past. 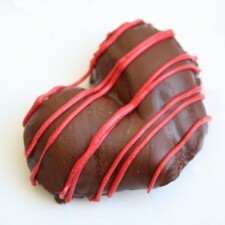 Surprise your loved one tonight or just make a special treat for yourself to enjoy! Red Velvet Cake Poppers – You can never go wrong with red velvet and these are small enough so you don’t cheat on your diet. Just eat one to satisfy your sugar craving or go ahead and splurge and eat them all! Red Velvet Oreo Truffles – Again, who can go wrong with red velvet, mix in some oreos and these are irresistible! Chocolate Raspberry Hearts – These are so much healthier than a store bought chocolate bar and super easy to make! Filet Mignons with Mushroom Sauce – Skip the crowded restaurants this year and make your special someone a homemade dinner. This recipe will be sure to impress them. Chocolate Covered Strawberry Hearts – These are super easy to make, plus who can resist a chocolate covered strawberry! Cheesecake Stuffed Chocolate Covered Strawberries – Take your chocolate covered strawberries to the next level and stuff them with cheesecake filling! They are amazing and will be gone as soon as you make them! Chocolate Covered Strawberry Cake – You can even turn your chocolate covered strawberries into a cake! It’s just as yummy as a chocolate covered strawberry. DIY Valentine’s Day Bath Bombs – Either before or after your massage (see below), hop in the bath with one of these bath bombs for a night of relaxation. Edible Massage Oil – Use this massage oil on a regular basis for your massages since it is organic and all natural or just try it out as an extra special treat on Valentine’s Day. Happy Valentine’s Day! We hope you enjoy some of these extra special treats.